The latest rain suffered at the FCBEscola Fukuoka came accompanied by the visit of a new arrival at the Japanese school. The newcomer was a cattle egret heron (Bubulcus ibis) which the Local Project Director, Óscar Coca, baptized Patxi. 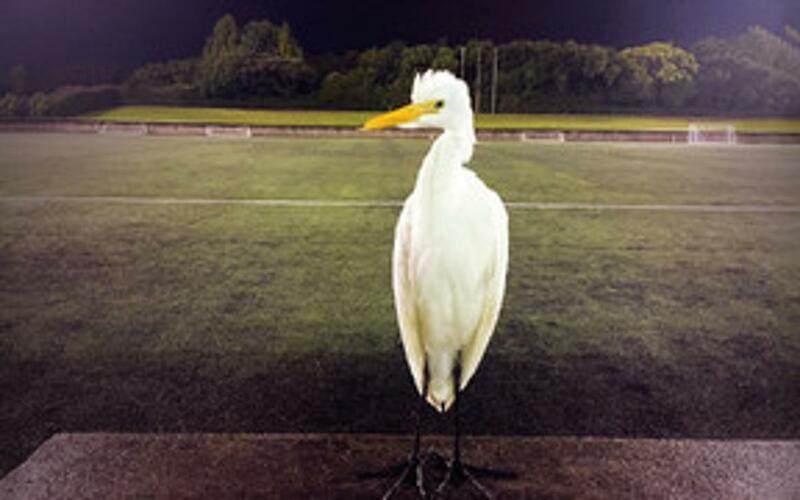 At first, the bird decided to watch the training from a distance but slowly he inched closer to the young footballers. It was right at the end of the training session when Patxi decided to have a wander around the pitch and then head towards the stadium. Despite the strangeness of the situation the bird was completely at ease and it seemed to enjoy being among the players. The FCBEscola Fukuoka students were surprised by its presence but they didn’t try and scare the bird away. However, when they did get close the heron flapped its wings and made itself look imposing. Before heading home, the students got their phones out to take some photos to capture the unusual moment. Patxi patiently waited around while the young players made the most of the opportunity to take selfies and group photos. Arigato, Patxi!